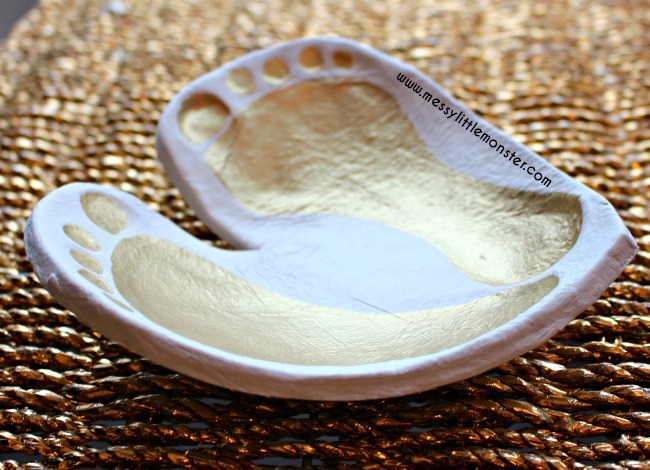 Learn how to make a clay footprint bowl keepsake using our easy diy instructions. 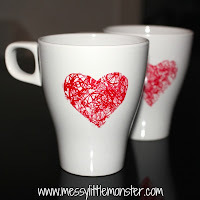 Use baby or toddler footprints and air dry clay to make a heart shaped ring dish craft to treasure forever. This beautiful clay bowl keepsake would make the perfect homemade gift idea for parents or grandparents. 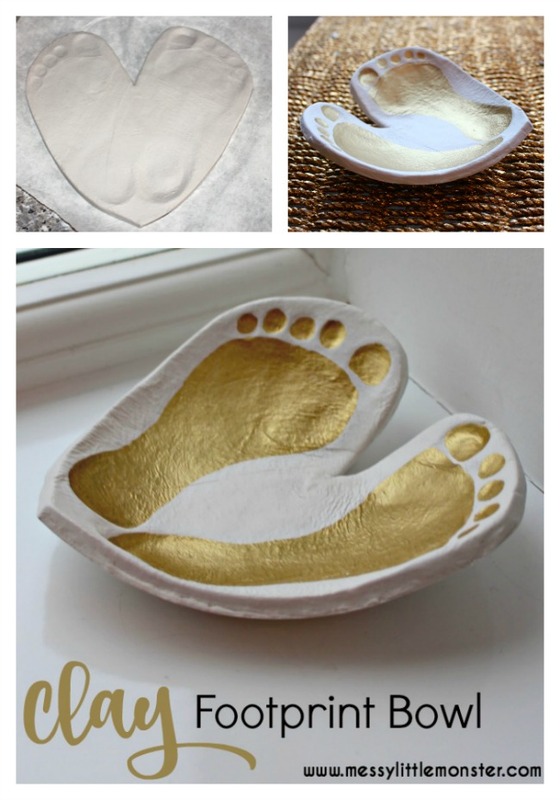 Your foot shaped dish could be used as a jewelry dish, key bowl or as a footprint keepsake ornament. Older kids could even use this technique to design a clay bowl of their own! 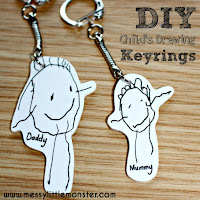 Children grow far too quickly so it is nice to make a few diy keepsakes along the way. 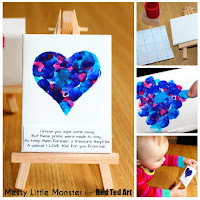 We have an every growing collection of DIY keepsakes crafts that kids can make and I love them all! We have made some adorable handprint and footprint ornaments over the years but today we decided to make something a little different, a clay footprint bowl. Clay bowls are a lot easier to make than you would think and they look stunning. 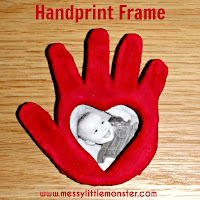 Making one of these beautiful diy keepsakes mean that you can treasure the memory of your baby or toddlers footprints forever. Clay crafts are very durable if they are taken care of and make more of a statement than handprint and footprint crafts made on paper. You could use these clay bowls as a ring dish for mom, a key bowl for dad or as an ornament for grandparents. Whatever you decide to use your footprint bowl for you are guarenteed to have a few people admiring it! These keepsake dishes would make great Mother's Day or Father's Day gifts. I was so pleased with the first clay bowl that we made for Grandma that I made a second for myself! As well as this air dry clay footprint bowl craft we have made an air dry clay handprint bowl using a similar technique. We also used a slightly different technique to make a salt dough hand shaped dish. The clay footprint bowl that we are sharing today was made using Daisy's (aged 2) footprints. 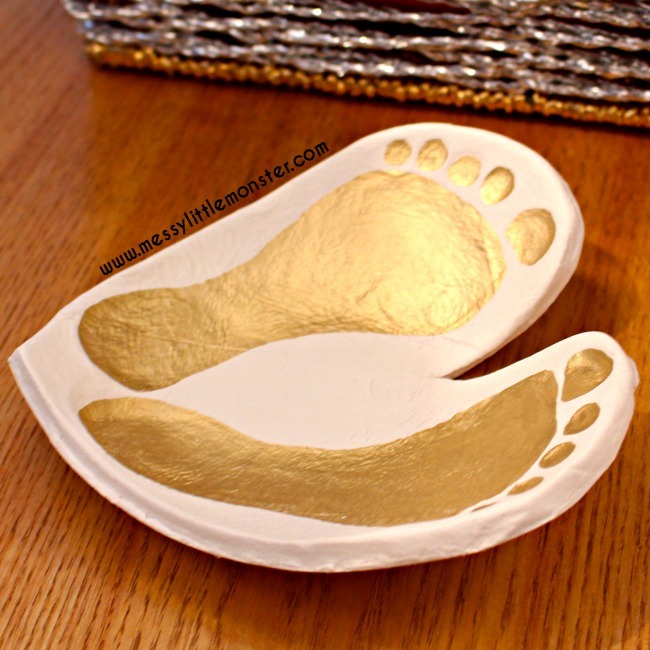 The air dry clay that we used turns white when dried which looks very effective against the gold paint that we chose to use to paint her footprints. I love that we made the footprints in the shape of a heart as it makes a beautiful shaped bowl. Break of a piece of air dry clay and roll it into a ball. Make sure that you put any clay that you are not using back into the pack as it dries out quickly. Flatten the ball of clay and use a rolling pin to roll it until it is about 1cm thick. Be careful not to make the clay too thin or the clay bowl will be too delicate once it has dried out. I would recommend rolling the clay on a piece of baking paper so that it is easy to move once you have created the footprints. Press your baby or toddlers feet into the clay. 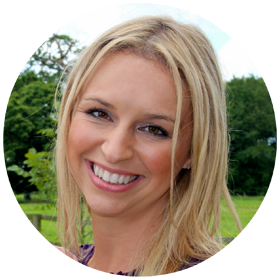 You will need to press your child's feet into the clay quite hard to leave a good imprint. Stamp one footprint into the clay at a time and create a heart shape by making the heels almost touch. For a baby the easiest way to make footprints in clay is to lie your baby down with a hard surface under their feet (a chopping board is perfect). Place the rolled out clay under your baby's feet so that you can put pressure onto each foot as you press them into the clay. Make sure that you remeber to press each toe into the clay to create a good print. Making footprints in clay with toddlers is much easier as they can simply stand up and push each foot into the clay one at a time. 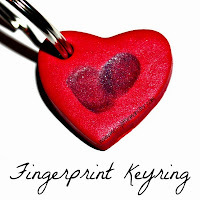 Use a sharp knife to cut a heart shape around the edge of the footprints. Cut close to the edge of the footprints but leave a little bit of a border around them as this will create a white border around your footprints once they are painted. Take your time with this step as it is important to get the shape of the clay bowl right. To smooth out any rough edges dip your fingers into a little water and run them around the edge of the clay heart. Turning the clay footprints into a bowl shape is a lot easier than you would think and it is what makes this craft so effective. 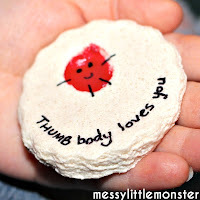 Put the footprint heart that you have made from clay into a small bowl. The bowl is being used as a mould to create the shape of your keepsake. Move the clay heart around in the bowl until you are happy with the shape and then leave it to dry. It is important to get this right as this is creating the shape that your clay dish will be when it is complete. I have found that clay bowls of this size take a couple of days to dry. After the first day I tend to take the clay out of the bowl and turn it upside down so that the botton can dry out too. TIP: If you cover the bowl with clingfilm (plastic wrap) before adding your clay footprint heart it will be easier to lift out the clay bowl once it has dried. Once your keepsake bowl has completely dried you are ready to paint it. I decided to just paint the footprints and leave the rest of the bowl the natural colour of the clay. Take your time and look carefully for where the footprint imprint is. 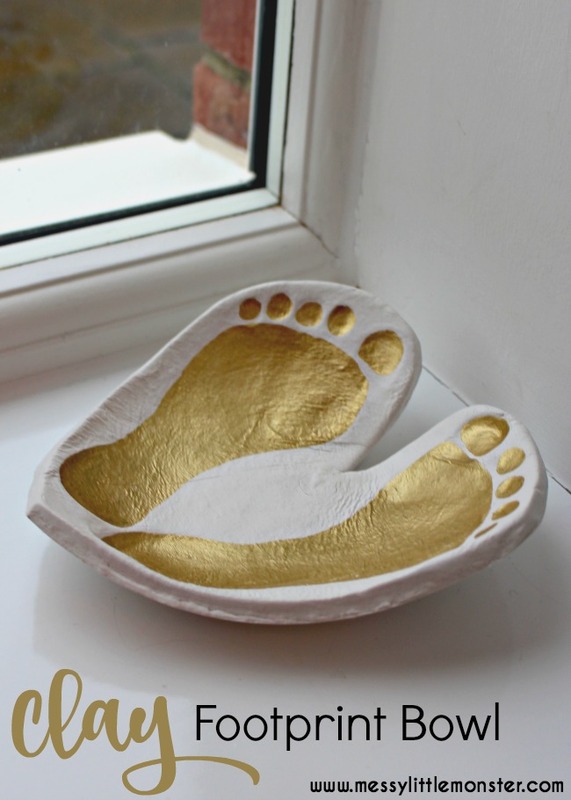 I used gold acrylic paint, but these footprint bowls would look beautiful in any colour. Alternatively you could let the children paint their bowl themselves to create a truly unique piece of artwork! 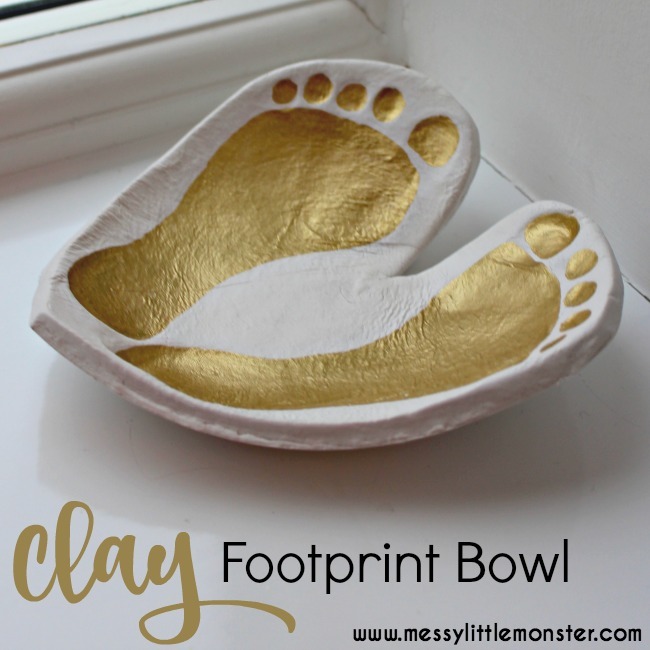 I made this clay footprint bowl keepsake as a gift from Daisy's (aged 2) for her Grandma and Grandad this Christmas and it was definitely well received. I also made a second clay footprint dish for myself as I loved it so much! I love the slight curve to the clay bowl and it is the perfect size for sitting on a window sill or on a small table. 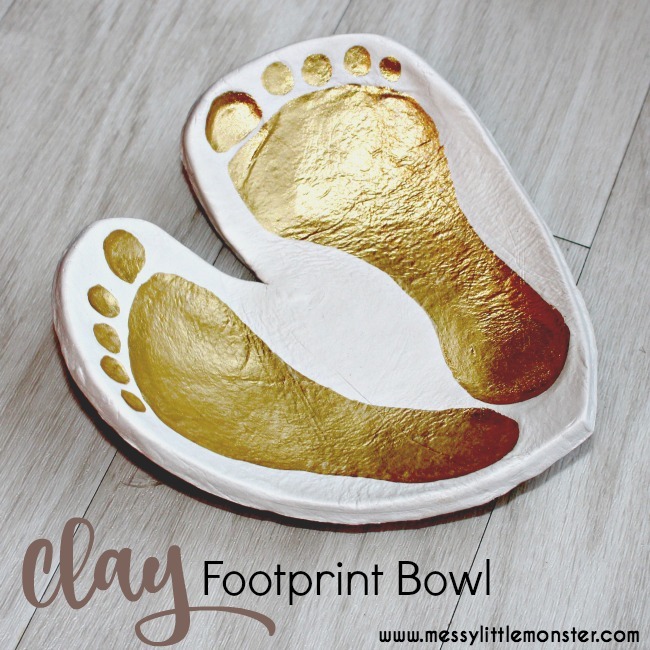 Making homemade gifts like this adorable clay footprint bowl keepsake are always popular with family members. 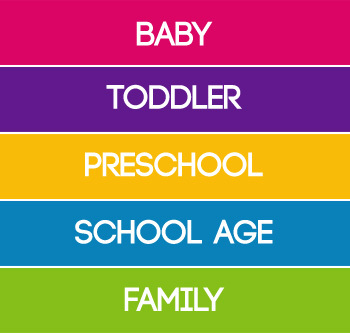 Children love giving gifts that they have made and they are always treasured by family. Even young children can feel a sense of pride as they hand over a small gift that they have played a part in making. Take a look at all our homemade gift ideas for kids to make (we have quite a few!). Whilst with these clay footprint bowls a lot of the work is done by an adult children will still feel like they have been involved in making the craft as it uses their footprints. Older children could take more ownership of a craft like this by painting their own bowl. I keep the clay footprint bowl that I made for myself as a keepsake on my dresser and I love using it as a ring dish to put my special jewelry in. I wonder if my daughter will let me have some of her air dry clay to do this with their feet...LOL. (And I wonder if my 7 and 9 year old will think I'm nuts.) They grow up so fast. Do you seal the air dry foot bowl when finished? If you want a shiny finish you could seal it but you don't need to seal air dry clay like you do salt dough. We didn't varnish ours.